The Popstar Royalty Sarah Geronimo has been dominating the music industry since she started her career. In fact the recent achievement she receive was on the release of Disney Channel Asia'snew music video for Disney Princesses "The Glow" around four days ago and gaining a positive buzz and views on You Tube. 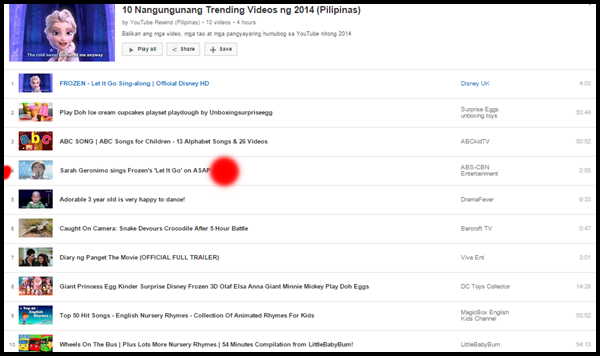 Today YouTube Rewind also announces the Top Trending Videos for 2014 and Sarah Geronimo's version of "Let It Go" is included on the list. Sarah made it to the list of YouTube Rewind's annual Top Trending Videos and again receiving a non-stop praises for singing the theme song of Disney Hit Movie "Frozen" which originally sang by Idina Menzel. The video is from Sarah's production number at ASAP published by ABS-CBN Entertainment last April 5, 2014. The Popstar Royalty Sarah Geroimo's Let It Go gain almost 6M views and it is with the Official Disney HD's Frozen (Let It Go), Play Do Ice Cream Cup Cakes, ABC Song, Adorable 3 year old is very happy to dance, Caught On Camera, Giant Princess Egg Kinder Surprise Disney Frozen 3D, Diary Ng Pangit (Full Trailer), Top 50 Hit Songs (English Nursery Rhymes) and Wheels On The Bus. Sarah also have a long list of nominations in the 27th Awit Awards including the Best Performance by a Female Recording Artist 9 (Ikot-ikot), Album of the Year (Expressions), Song of the Year (Ikot-ikot), Best Selling Album of the Year (Expressions), Best Ballad Recording (Sweetest Mistake), Best Dance Recording (Tayo), Best Inspirational/Religious Recording (Make Me Yours), Best R&B Recording (Ikot-ikot) and Music Video of the Year (Ikot-ikot and Tayo). I will be at the 27th Awit Awards presentation of winners this Friday and I'll try to update you guys as much as possible for the winners and photos of them, Let us follow each other on Twitter and Instagram @ning4u and share each others favorite singers and performers oki :).